Sidewalk Poem - Esther M. Sternberg, M.D. 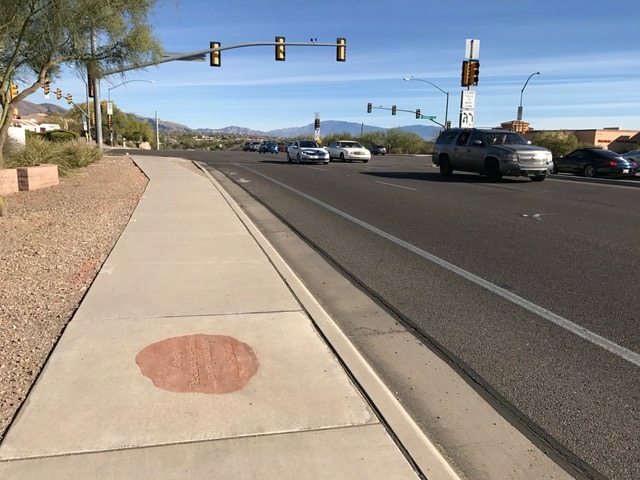 I came upon this poem, carved into the sidewalk in the most unlikely place – along a six-lane thoroughfare in the Tucson Foothills, overlooking the city and Tucson Mountains to the south, flanked by the Santa Catalina Mountains to the North. I have driven by this spot at least several times per week and sometimes more, from the day I moved to Tucson four and a half years ago. I mostly drive by, like all the other cars, at the speed limit of 45 mph. I slow down if I am turning into my bank’s parking lot at the corner, but I never noticed this poem until today. That’s because the only way to see this poem is to walk over it. Yesterday I was forced to walk over it because my car wouldn’t start. I had been rushing about doing holiday shopping and last minute errands, feeling good about myself as I checked off each item on my list. It was well past lunch time, and though hungry, I kept telling myself – just one more thing I need to get, just one more place I need to stop at – then I’ll go home. I had run out of cash so I decided to go to the bank to get cash out of the ATM. I drove into the parking lot, parked, dashed out to the ATM, got the cash, jumped back into the car, set to do just more thing on the list. So I called AAA. They took all my information and said it would take an hour for the service person to arrive – enough time for me to walk across the street to the deli for a sandwich, and be back at the car waiting. I felt irritated. So much more to do, and now I was stuck. But, then I thought, it was a beautiful, sunny afternoon, I was stopped in a beautiful place, I was safe – things could be a lot worse. So I started out on my little adventure, heading along the sidewalk to the stoplights at the corner. Cars were whizzing by at top speed – daunting if you are walking along that stretch of road. And then I looked down, and saw the poem. I stopped, turned back and looked at it again. This is exactly what my car’s breaking down had forced me to do – sit still. 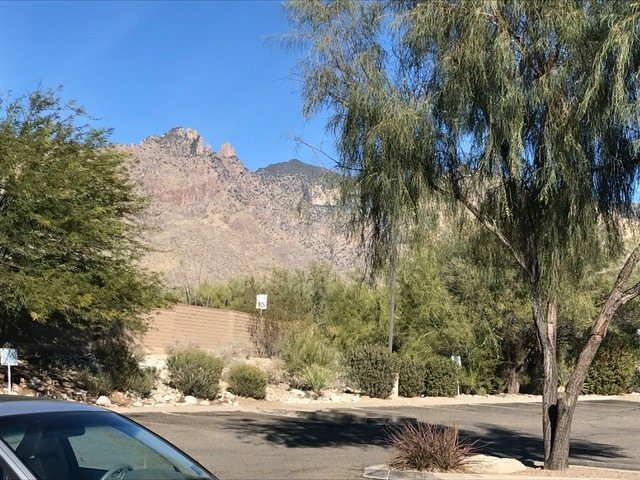 I looked up at the mountains behind the bank, and I thought, how fortunate that my car wouldn’t start. I may never have noticed this poem for another four years, and what a loss that would have been. Sometimes you have to be forced to stop in order to think. It made me think of Emily Dickenson’s poems, which she refused to publish during her lifetime, because, as she emphatically wrote to her editor, they “did not print.” They needed to wait for the fluid forms of the digital page to be fully understood, since their shapes were so important to their meaning. They were a fusion of graphic art and words. 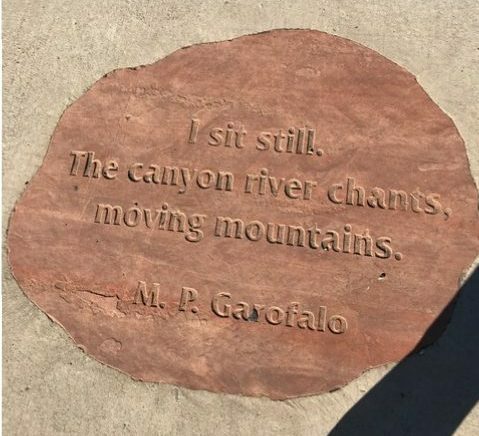 What clever person thought to actually impress Garofalo’s poem into concrete, in this completely unlikely spot! The image-shape in that setting did make one sit still – the words took on a whole new meaning, greater than the words would have just on a printed page or screen. It made me look at those mountains, looming above me, to 5000 feet, and think how when the monsoons come, the water courses down these streets, and could take with it some of the mountain’s slopes. It could move mountains, and did, long before the street and shopping malls and bank were built. And it will continue to do so long after they are gone. And so, after pausing to look back again, I continued on my way, grateful that my car had broken down, and given me this gift on a beautiful Sunday afternoon.